With the release of the new QUEEN at YoYoExpert, we are happy to present the new 2SickYoYos Logo T-Shirt! 2SickYoYos is a new American yo-yo company started by Joey Serrano. Joey has been yo-yoing for a long time and when he decided to pursue his dream and start a yo-yo company he brought his idea to the amazing members of the YoYoExpert Forums for advice. With their support and advice he was able to successfully release his first model (The Gambit) and now we are proud to carry the amazing new second release - This is the 2SickYoYos Queen! 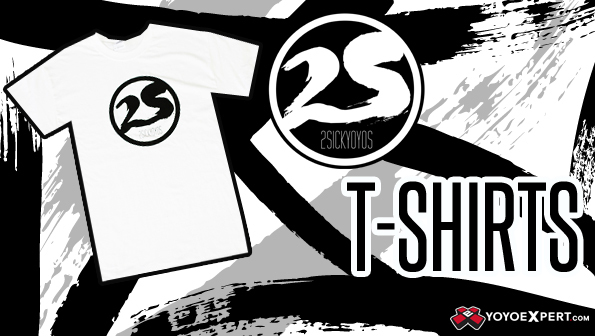 Pick up one of the 2SickYoYos Logo T-Shirts and support a great new American yo-yo company! These 2SickYoYos T-Shirts are available in Adult Sizes printed on Gildan 100% cotton preshrunk tees.